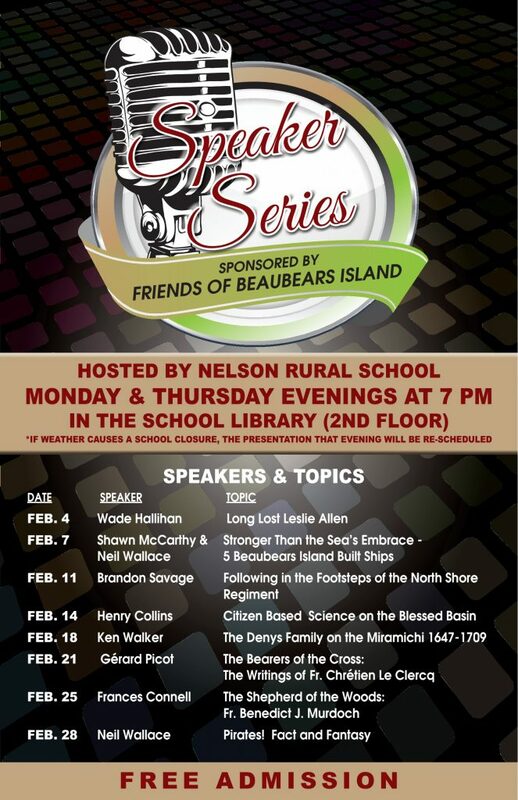 The Friends of Beaubears Island will once again host Miramichi historians in a Speaker Series during the month of February. Presentations will occur in the library at the Nelson Rural School, 26 St Patricks Drive at 7pm on Monday and Thursday evenings throughout the month of February. Wade Hallihan’ s presentation will be based on the story of Leslie Allen: a hunter from Moncton who was lost in the woods near Blackville in 1927. The case was the subject of the poem/folksong “Leslie Allen” written by Michael Whalen – the “poet of Renous”. Hear the story of the hunting party, the weeks long search, and the aftermath. Hear Messrs. McCarthy & Wallace recount the stories of 5 ships built on Beaubears Island – Sally (built 1801), James Hunter (built 1825), Ostensible (built 1849), Chevalier (built 1852), and Vicksburg (built 1863). Discussion will include their voyages to various ports throughout the world. The evening represents an opportunity to learn about what became of theses after they left the Miramichi. Local history teacher Brandon Savage will recount his onsite and document research into the postings of the North Shore Regiment during peace and wartime. from England through to Germany. Come and hear details of one of Canada’s most famous fighting units of World War II. our own North Shore soldiers. Harry Collins represents the Miramichi River Environmental Assessment Committee (MREAC) as its Executive Director. The organization has functioned as a community-based not-for-profit watershed organization since 1989. MREAC’s primary objective is environmental stewardship and management of the Miramichi watershed. Ken Walker looks back more than three centuries to a time when the domain of Nicholas Denys, governor of Acadia, extended along the southerly side of the Gulf of St Lawrence, from Miscou Island to Cape Breton. It included a trading post at Miramichi in the 1640s, though the first extensive French establishment on the river was that of Denys’ son Richard. Gérard Picot presents a discussion of the writings of Fr. Chrétien Le Clercq, a Recollect Franciscan friar and missionary to the Mi’gmaq in the mid-17th century. He was a chronicler of New France, who wrote two early histories. Frances Connell presents on Fr. Benedict J. Murdoch, who wrote ten books, his first being The Red Vineyard (1923), a spiritual autobiography of his wartime experiences in the First World War. Most of the other works were fictional or spiritual, and are less well known. Finally, Neil Wallace doubles down this year with a presentation looking to the Golden Age of Piracy of the early modern period. In its broadest accepted definition, his conversation will span the 1650s to the late 1720s. There certainly looks to be something for everyone, so why not come out? You’re sure to learn a bit more about this fantastic community of ours and it’s impact, both across the country and across the globe.